Save the date! June 18-21 SLLI Retreat - Rising Wolf Ranch, East Glacier Park Application DEADLINE: April 1, 2019. Selected participants will be notified by April 9th. 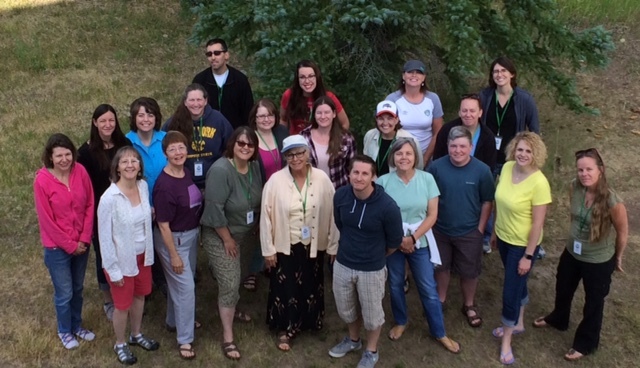 The 2019 Summer Library Leadership Institute (SLLI) will met July 18-21 for an intensive 4-day retreat at the Rising Wolf Ranch near East Glacier Park, MT. The institute occurs every other year and is targeted to librarians who have recently entered a leadership position, wish to advance their careers into leadership, or desire to expand their capacity as leaders. The training retreat and follow-up training events are all free - room and meals inclued. Participants agree to complete the 9 month program and to develop and implement a project that puts their new leadership skills to work. RECOGNIZE THEIR OWN LEADERSHIP STYLE as well as the benefits and challenges of their style, so that they can participate more productively in management teams and to effect positive change in their library and community. DEVELOP LISTENING & COMMUNICATION SKILLS so that they are able to INSPIRE OTHERS and collaborate toward a shared vision. Be CONFIDENT TO TAKE RISKS and to create an environment that is resilient in failure so that libraries and librarians are positive innovators in their communities. PURSUE THEIR OWN LEADERSHIP DEVELOPMENT to try new things, grow, to evaluate their efforts, to view hardship, failure, or fear as a catalyst for positive change in their own lives, their libraries and communities. Be OPEN TO CHANGE; they develop goals and a process for how to address their own leadership weaknesses and implicit biases. Find the 2017 SLLI logic model, which lists inputs, outputs and outcomes, by clicking here. For a glimpse of the projects from the 2015-16 participants, see this video. For a report of the 2017-18 projects see this story map. have considerable risk for failure.